I have been planning to build a bird house or nest box from a real wood tree log for several years. I like the way they look and the extra thick walls insulate the birds from heat and cold. 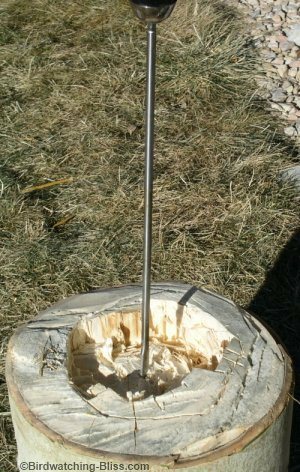 I had been looking for a nice 10-12 inch log, so when we found a fresh fallen 10 inch aspen near our campsite two years ago, I knew I found the right log. I didn't want to split the aspen log, because I like the way the bark looks and didn't want to mark it up or have it fall off the log. I chopped a two foot section from the downed tree with the idea that I could make two nest boxes. The birds most likely to use the nest log at our house were Tree Swallows. They had successfully nested for several years in a nest box attached to the down spout on our front porch. As the trees in the front yard grew, there seems to be more competition from house sparrows. A female Tree Swallow as actually killed several years ago in the box. We assume the house sparrows were responsible. The new aspen nest log was going to be mounted in the back yard, where there was more open space. Since Tree Swallows commonly nest in bluebird houses, many people assumed the two species need the same size box. Wrong. 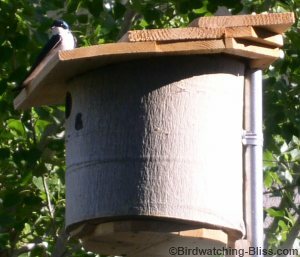 According to the Tree Swallow Projects website, a Tree Swallow nest box should have a minimum floor space of 5x5 inches and a depth from the hole to the floor of 7 inches. 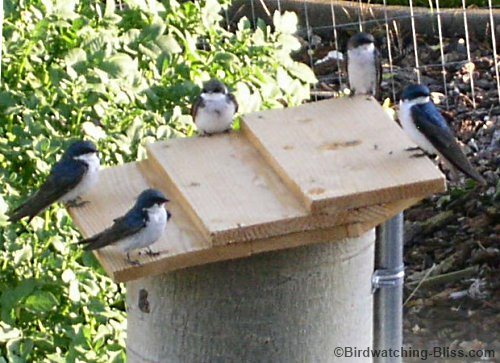 A growing brood of Tree Swallows becomes too crowded in the small bluebird nest box and that reduces their nesting success. They can and will use a small box if nothing else is available, but more nestlings survive if the box is bigger. 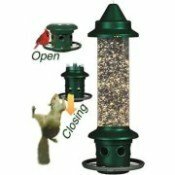 If the recommended floor space of a tree swallow bird house cavity is 5x5 inches or 25 square inches, what size log is needed to create a cavity with the same area? Yes, you can actually use some of the that math you learned in school. If my log was 10 inches diameter, then the radius was 5 inches. If I left two inches of wood all the way around, the radius of the open cavity was 3 inches. The nest log was still very heavy with two inches of wood left around the edge of the log, so I thinned it down to 1½ inches. Our houses are built with 2x4 lumber, which is 1½ inches thick, so that should be plenty thick for a bird house. After I took another ½ inch off the nest log, it was lighter and still plenty strong. This also added ½ inch to the radius of the open area inside. I hoped that would not be too large. What Size Nest Log is Needed? 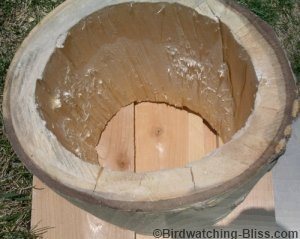 If you are considering making a nest log, I calculated the size log needed to create the minimum cavity area required for several cavity nesting bird species. 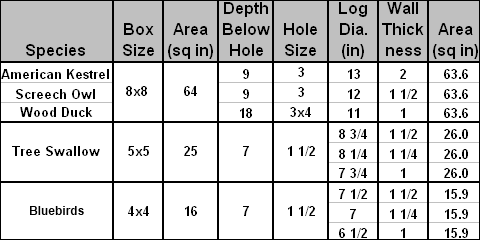 Table 1 shows the recommended nest box sizes for three sizes of nest boxes and for five species of birds that commonly use nest boxes. American Kestrels, Screech Owls and Wood Ducks need nest boxes at least 8x8 inches. This area totals 64 square inches of space. That minimal size requirement can be met with logs between 11-13 inches diameter with wall thickness between 1 and 2 inches. A 14 and 15 inch log with a 2 inch thick wall would be 78.5 and 95 square inches respectively, or 23% and 49% larger than an 8x8 inch nest box. The minimum requirement can be met with logs as small as 7¾ inches if the thickness of the wall is reduced to one inch. If the nest log wall is 1½ inches thick, the minimum requirement is met with an 8¾ inch log. 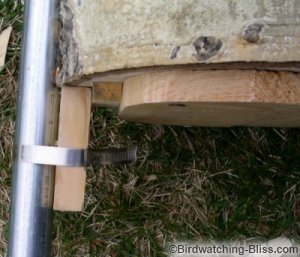 You have already seen that the nest log we used for Tree Swallows was 10 inches and a 3½ in radius cavity was created for an area of 38.5 square inches, or 54% larger than the 5x5 nest box. The small 16 square inch cavity required for bluebirds could be met with logs as small as 6½ inches if the thickness of the wall was cut down to 1 inch. Keep in mind, these are minimal areas. 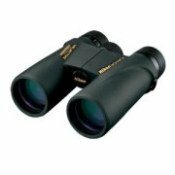 A little bit bigger may be better, but too much bigger may not be what the birds are searching for. Also, part of the reason for using a log instead boards is the thicker walls which provide better insulation. If we create nest logs with very thin walls, we loose the extra insulation. 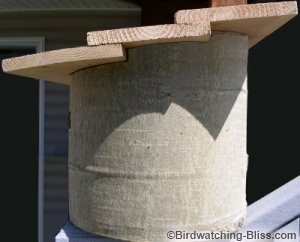 A 9½ inch log with a wall thickness of two inches creates a cavity space of 23.8 square inches, or 48% more space than the 4x4 nest box. It might have been easier to hollow out the log while it was still green, but I basically left it in the garage for several months. By the time I started to work on the log, it had lost several pounds of water weight. I originally planned to hollow out the log with a chain saw, but I just started chipping away at the log with a chisel one day while enjoying a warm late Winter day in the Sun. It became more of an afternoon relaxation ritual than a job. 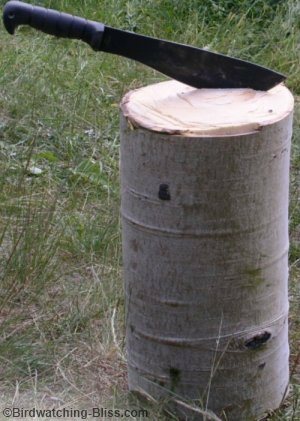 On nice days, I would take 30 minutes breaks from whatever I was doing, go to the back yard, sit in the Sun and chip away at the log. For those of you that believe in karma and positive energy and that sort of thing, except for the occasional smashed thumb, I was putting all kinds of good vibes into the box. You could say I was wasting time, but I like to think I was being very productive while half-snoozing in the Sun. Just don't snooze too much with a hammer and chisel in your hand. I also used a very long (x inch) drill bit to drill holes from one end of the log to the other. Then I alternated between the chisel and the drill depending on which method was more productive. I used the chisel to smooth out the roughest sides, but don't make it too smooth, so the fledglings can grab onto the sides when they scramble out. When the nest log was close to being finished, I cut the log in half, thinking I could build two nest logs. Needless to say, if you use a chainsaw, be very careful, not only of your fingers and toes, but a single slip would ruin the nest log. 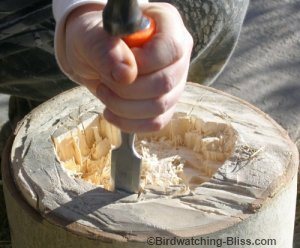 If you have a lathe, you would hollow the log as if making a bowl. 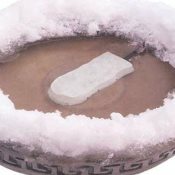 A slight rounded bowl shape would be perfect for the bottom and would only need a few drainage holes. In addition to the overlapping shingle roof I used, there are many ways to put a roof on a nest log. The Figure below has a few examples of roofs I have seen on nest logs. I chose to overlap cedar shingles that were made from inexpensive cedar fence pickets. The boards are 5½ inches wide and 6 feet long. I like the final look and function of the roof on the log box, but I did not think it out very well before hand. The cuts I had to make to fit the roof, especially with the slope, made the box shorter than I originally planned. It is simple to slap something on the bottom, but it is difficult to cut a close fitting circle to recess inside the log. After I shaped the top to match the roof, I realized that the nest log barely had the minimum 7 inches from hole to floor. Because the birds have more space than recommended, it probably doesn't matter if the depth were 6½ inches instead of 7 inches, but I chose to simply attach the floor on the outside. It is not as nice to look ate, but it is functional. The floor is held with screws. At the end of the season, the floor is removed and the old nest is cleaned out. The hole size recommended for Tree Swallows is between 1 3/8 - 1½ inches. 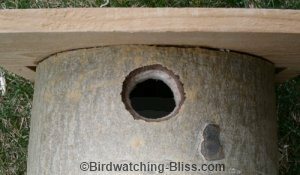 I think it is a good Idea to keep the hole as small as possible, but after watching the Tree Swallows struggle to squeeze through the 1½ inch hole, I expanded and re-shaped the hole. It is one thing to be able to squeeze through a small hole in a thin ¾ inch wall, but it is more difficult to squeeze through the same size hole in a 1½ inch thick wall. After the birds left the box, I spent 3 or 4 minutes and quickly re-shaped the hole with a wood file, so it was wider at the front and back of the hole, but left the middle of the hole at 1½ inches. After that, the birds still had to squeeze through the whole, but it was obviously easier for them. 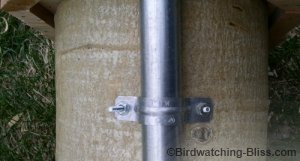 There are a variety of ways to mount nest boxes. I used 1 inch aluminum electrical metallic tubing (EMT conduit) for a mounting pole. The conduit was attached to the box with a conduit strap and two bolts. To make sure the box did not slide down the pole, the roof rested on top of the conduit and I also attached a wooden block to the conduit with a hose clamp to hold the bottom of the log. I used a simple method of driving a 5 foot section of a ½ inch rebar about 3½ feet into the ground. The conduit simply slides over the portion of the rebar that is above ground. Several large rocks are used to support the pole at the bottom to reduce motion and to keep the pole straight. The whole point of this is to provide nest boxes for beneficial birds. It is good for us because we get to enjoy watching them and they also eat thousands of insects. It can also be educational to watch them as they spend hundreds of hours working to build their nests and to raise their young. Building nest boxes are also good for the birds. A good nest box mimics natural cavities which are usually in short supply, especially in developed neighborhoods. Within hours of mounting the box on the pole, the Tree Swallows were checking it out and at least two pair of birds fought over the box for several days. There were at least four young fledged from the nest that year. They only hung around for a day or two after they fledged, and it was very confusing when other adults and possibly other young birds came to the box. I made several log bird houses when I was a kid. They were made from tulip poplar and pine logs that I spit into quarters, as if splitting firewood. The middle part of each quarter was chopped and shaved down with a hatchet, leaving the top and bottom untouched. I reattached the four quarters with glue and a couple of screws. These nest boxes didn't need an additional roof or floor. I simply drilled a few drain holes in the bottom and an entry hole on the side. They hung in the trees in my parents yard, where they were used mostly by Carolina Chickadees.